Undoubtedly, the last few years internet-based tools and social networking have invaded into student’s daily routine. 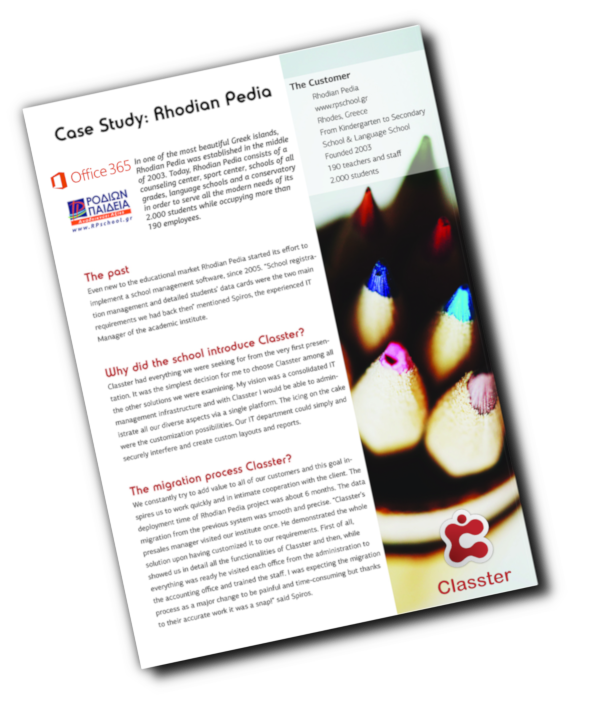 Classter is designed to meet the needs of today’s digital students. Thus the software’s use will help you embrace your student’s needs and expectations. Via using their personal dashboards, students can access their academic information and view their absences, their academic calendar and announcements, timetable, homework, duties, and remarks. Additionally, the students can see the bus routes, Moodle courses and they can have access to the school library for online search and reservations. Classter can engage more thoughtfully the students, making them responsible for their learning and progress, while it can foster collaboration between the students and their teachers as well. 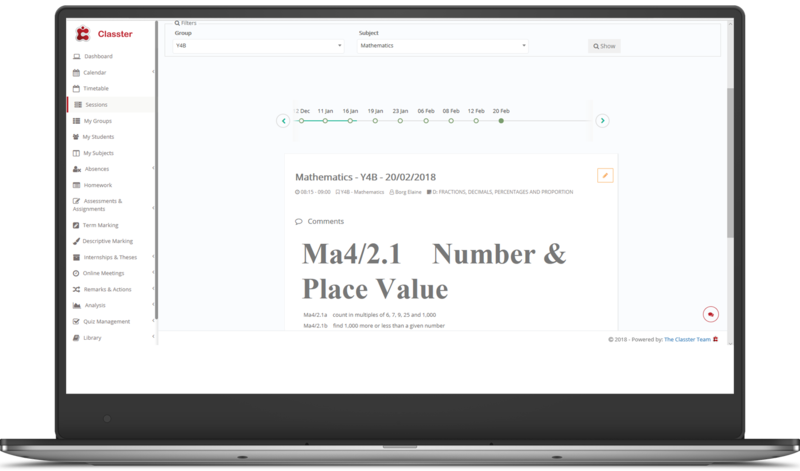 Through the portal, the students can easily access and return assignments, read and download content, and compare their overall performance against the group average. 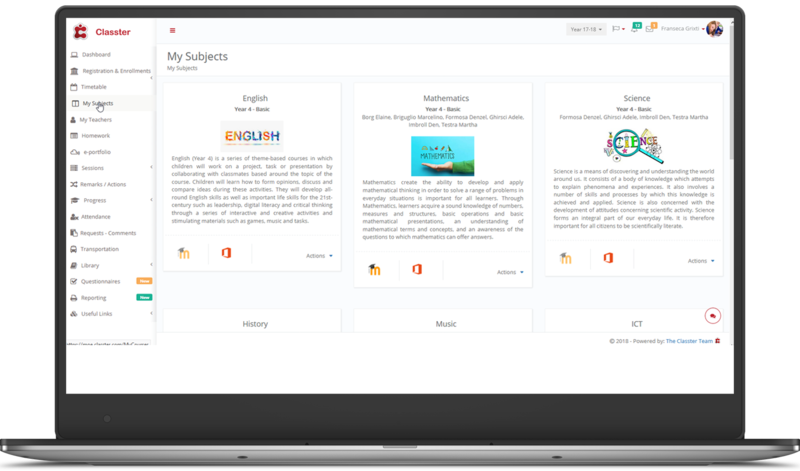 Furthermore, it is possible to use Classter to add content and integrate with external educational apps to increase students' engagement. Teachers via using their personal web portal can have access to valuable data and information concerning their students, while they can view their academic calendar and announcements, from their PC or tablet. Equally important is that teachers can efficiently manage events and record or edit sessions, homework, quizzes, assessments, exams, remarks, attendance, behavior. 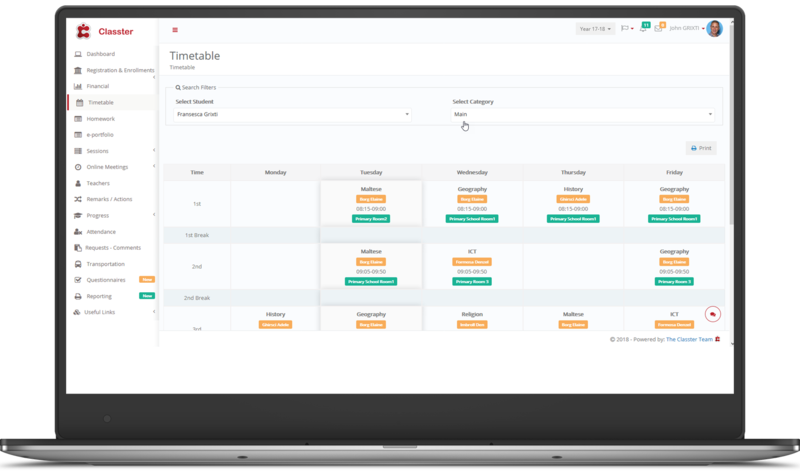 Classter can provide your teachers with a secure and flexible working environment, within which they can schedule assignments, upload exam and term grades and assessments. Moreover, the system allows teachers to support their students by having access to detailed performance analysis reports. Furthermore, it is also possible for teachers to create course libraries, upload videos, documents and blogs per session. Classter is a unique tool at the disposal of any teacher that can save their time, generate automatically reports and statistical analysis reducing paperwork for teachers but also the administration staff. Classter is a valuable tool for parents, promoting parental involvement and making parents partners in the student’s learning process. In that way, parents can be more supportive of their children and help them maximize their academic and personal performance. The system provides parents with their personal profiles, allowing them to have access to real-time data. Parents can have access to their child’s accurate timetable and be informed about his/her academic performance, while they can also be notified regarding their children’s duties, homework, assignments, grades, and absences. Moreover, parents can immediately be informed about the bus routes and possible changes, while the system tries to prompt them to upload their feedback regarding the institute's operations, incidents or other issues that they consider to be important. Using Classter portal will make parent’s daily routine less stressful and at the same time more organized, as they can arrange online the tuition fees and enrollments to courses or extra-curriculum activities. Classter also fosters communication among the parents but also promotes the establishment of an active collaboration between teachers and parents. What is more, via the Classter platform parents can request for official certificates and be informed about the upcoming events. Employees have also their personal Classter dashboard. This unique web-based tool allows back-office employees to adequately manage all daily operations including admission, registration, enrollment, academic and financial services. Moreover, employees have access to the list of subjects, courses, activities, groups, etc. Back office employees through the portal have access to the detailed demographic and family information about students, parents, relatives, and teachers. Furthermore, Classter allows employees to efficiently manage announcements, events, meetings and improve the overall institutes' communication mechanism by using the advanced Classter communication & marketing module. Applicants and parents, who are not yet registered in the institute, can access the system using the Admission portal. By using the admission portal, potential applicants can register using their personal verified email. Once the system checks their email, they can access the admission portal, where they have access to events planning, announcements, and personal notifications. Additionally, via the admission portal the applicants can create their online applications, register their personal information and upload all the necessary documents for their use, select optional extra-curriculum activities or subjects or even get online financial offers and personal payment agreements. Once the applicants are accepted as registered students, they and their parents automatically get access to the regular student or parent portal using the same username and password they used for the admission process. Qualified graduates are a valuable resource for every institute. Hence, to establish a reliable communication relationship with your alumni, Classter offers social networking tools for alumni users. By using the Alumni portal, your graduates will have access to the institute’s news, announcements, and events. Building an engaging and active alumni network is crucial to an institution’s success and professionalism. Classter will allow you to establish a strong alumni network of highly skilled graduates that will more likely give back to the university. Back office employees have access to District management tools and can manage multiple institutes or academies from a single interface. Cross institute management tools enable back-office employees to control the central management of students and teachers, as well as the transfer of subjects, educational programs, curriculums or settings from one institute to another. Overview of academic data and comparison statistics are also included in this dashboard.